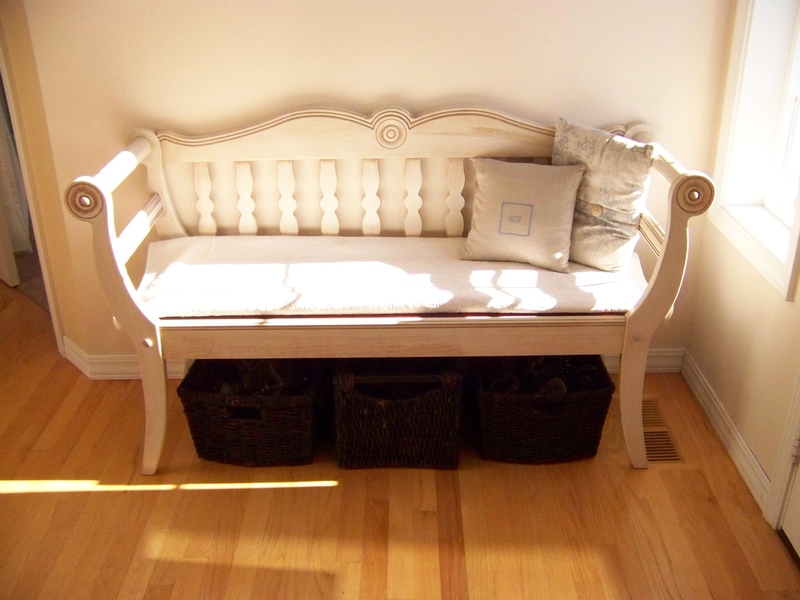 Do you remember back in March when I blogged about the Healthy Habit of removing shoes at the door, and mentioned I was working on making my entryway more friendly to shoe removal? Well, I finally have something to show you. Here is my entry [before]. Not welcoming, and very boring. 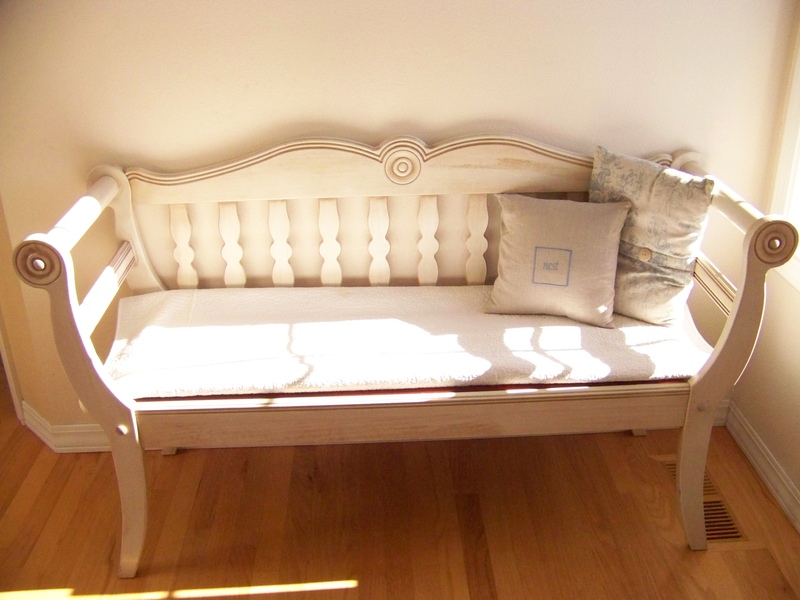 I looked for a couple of weeks for a great bench, and finally saw this one for $60. Too bad it was about 45 minutes away, but then all the good stuff seems to be that far away from me. It just fit into the center area of my minivan (seat removed), with the kids stuck in the back. It’s a solid quality piece of furniture, but came with no pad. (Strange how the seat is stained a different color, isn’t it?) So I threw down a white quilt and some pillows, and it was OK for a couple months. We continued to use the small metal bin for shoes, but as warm weather came we always had a pile of shoes in the corner which didn’t fit in the bin. It’s the other corner of the entry, and I don’t have a picture, but I’m sure you know what a pile of shoes looks like. Not pretty. So I started shopping for baskets to go under the bench. So after several trips to multiple TJMaxx’s, Ross’s, and finally HomeGoods, I found these baskets. I learned something: these kinds of discount home stores only stock 2 of any kind of basket. It’s like a rule or something. One cannot find 3 of a kind at these places. At least not in the dark color I wanted. So the middle one is the same type of material as the two on the sides, but a slightly taller shape. And our shoes fit great. All this time I was considering what type of fabric I would want on the pad/cover I would make. 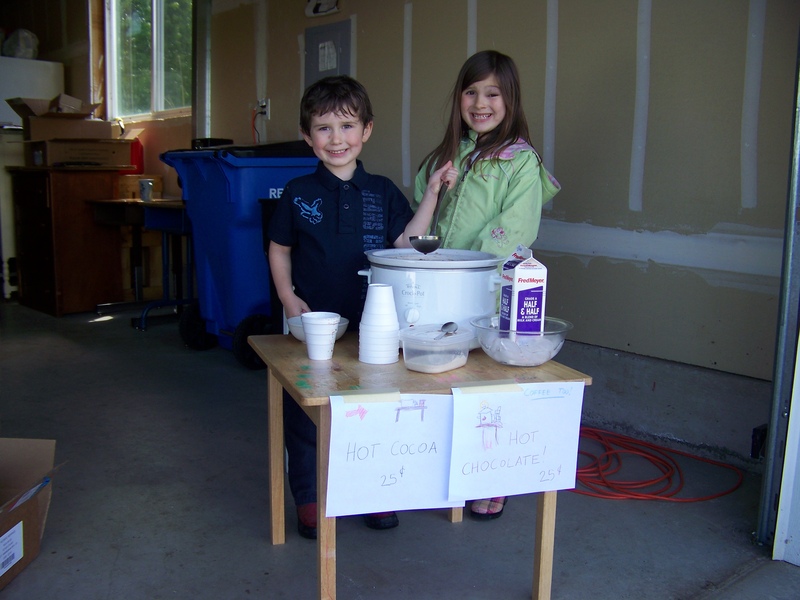 My children selling hot cocoa (day 2 of the garage sale). We discovered that kids can sell a lot more at a lemonade stand (day 1) than cocoa stand, even if it is raining. And then we had a block-wide garage sale. My neighbor was selling upholstery from her garage; she has 2 pallets of a wide assortment of fabrics. 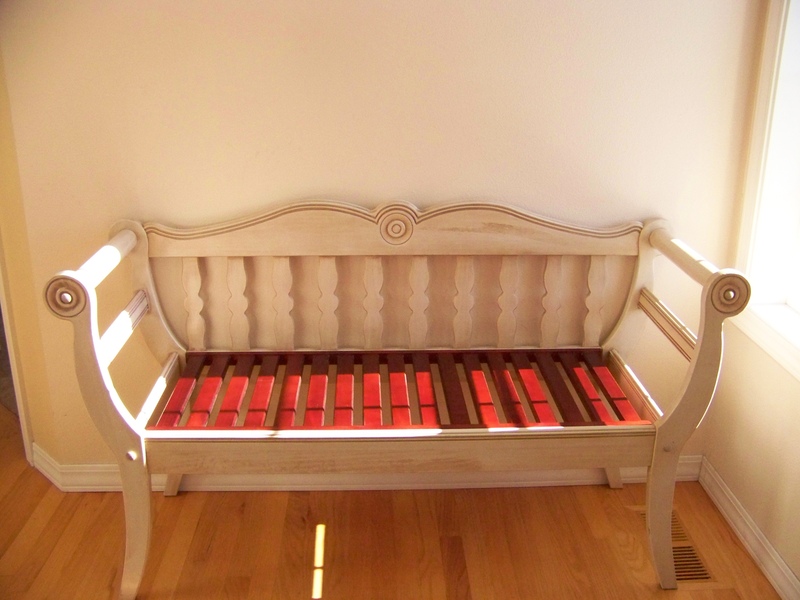 She let me take several home to compare them to the bench, and then when I decided on one, she gave it to me. Thanks, Trish! I really like the brown and cream houndstooth check. I think it’s classic, practical, and stylish. Then it was just a matter of time for my pregnancy nesting instinct to kick in with enough energy to work on the pad making project. 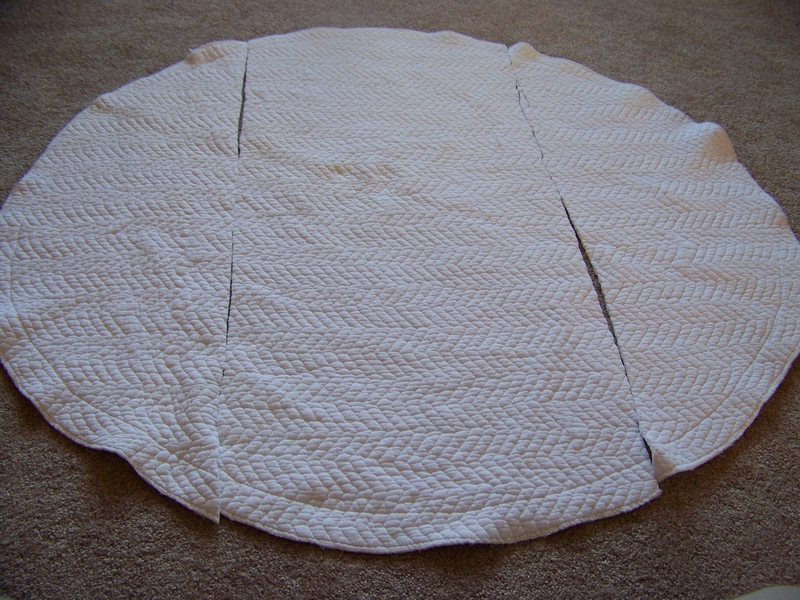 For the pad, I used an old bedspread, cut to size and piled 7 layers thick. The cording is some light rope we had the in garage (I think it is made for clothesline).This is the first time I’ve done a cording project, and it was a learning experience! The houndstooth check made it easy to cut straight pieces and pleat the skirt. The pad took me several days to make, working on it during toddler nap-time. Then I wanted to add some more pillows to the bench than I’d had on it, and I had picked up this ugly but clean pillow at a garage sale for 25 cents. I had this pad thing in the linen closet. It’s from my grandmother and she couldn’t remember what it was for. . . seems like a table pad? 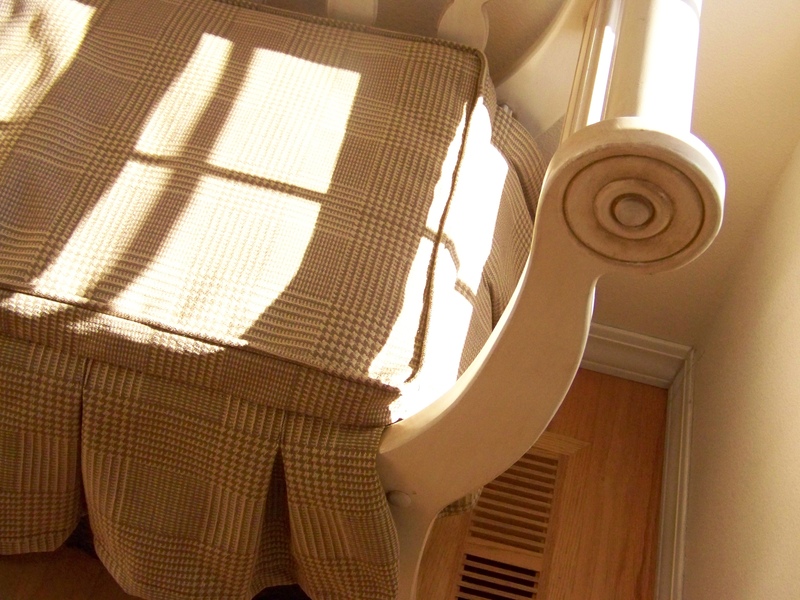 Anyway, I like the old soft cotton and the quilted texture. I cut the center out to sew into a cover for the pillow. Two side seams and an envelope opening in the back to pop the pillow through. 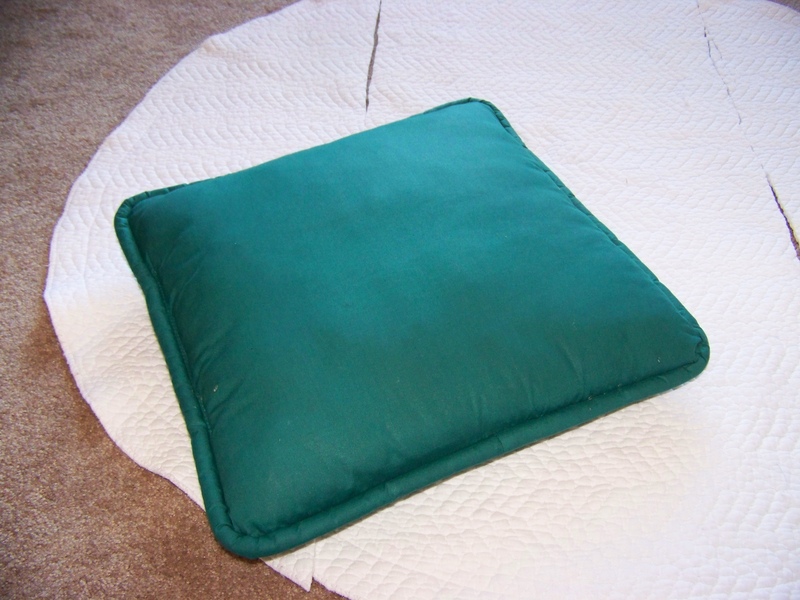 After sewing the bench pad, this pillow cover was easy-peasy! 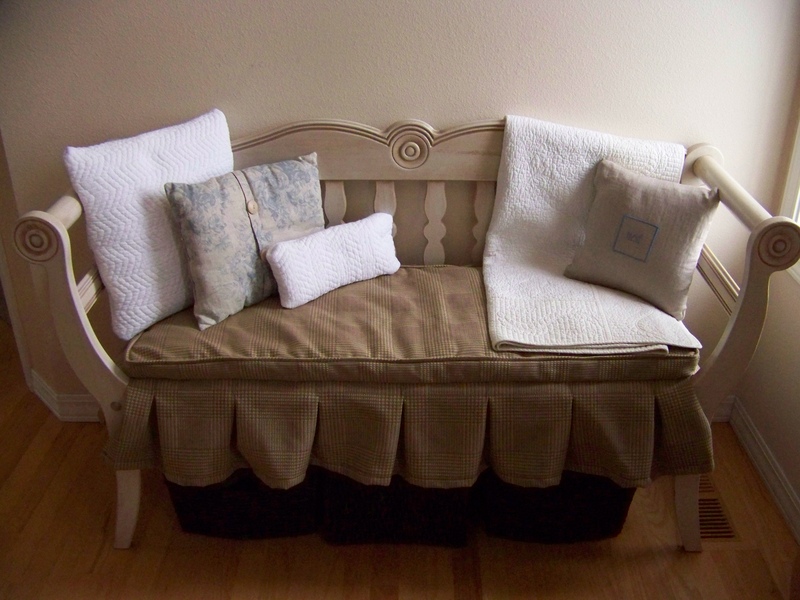 Then I used a scrap piece to make a tiny pillow, and piled them on the bench with the pillows I’d had on it all spring. 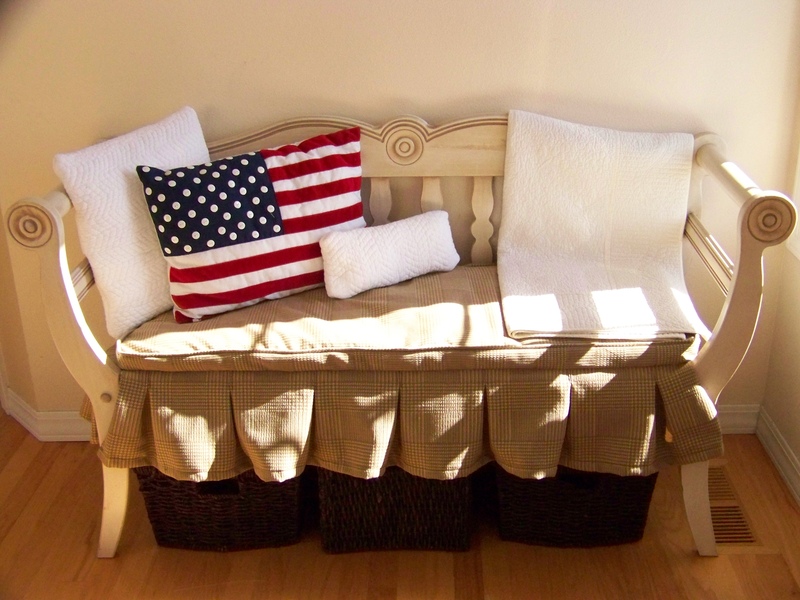 But after looking at it for a day I felt that the putty, blue, and white color scheme was too pale, at least for summer, so I switched in the flag pillow. 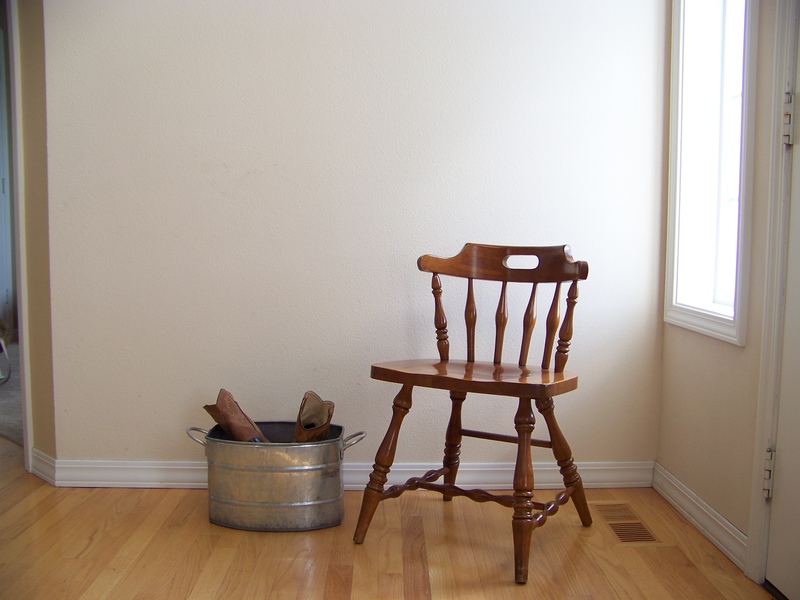 I’m linking to blog parties at theinspiredroom and funkyjunkinteriors.